An important part of my Integrative Space ™analysis of a medical facility, clinic or senior living complex is to discover where the staff can hang out. This is the place where employees can eat their lunch, have some coffee, hang up their coats, store their personal belongings, get away for a few minutes. Providing such a space is a strong message to the employees that someone in their healthcare organization cares. The facility isn’t just about patients or residents, although that is unarguably the focus. But to satisfy the patients and residents, there’s a behind-the-scenes team who must be considered. The staff are the valuable people who can make or break the facility. They, too, need to be cared for. 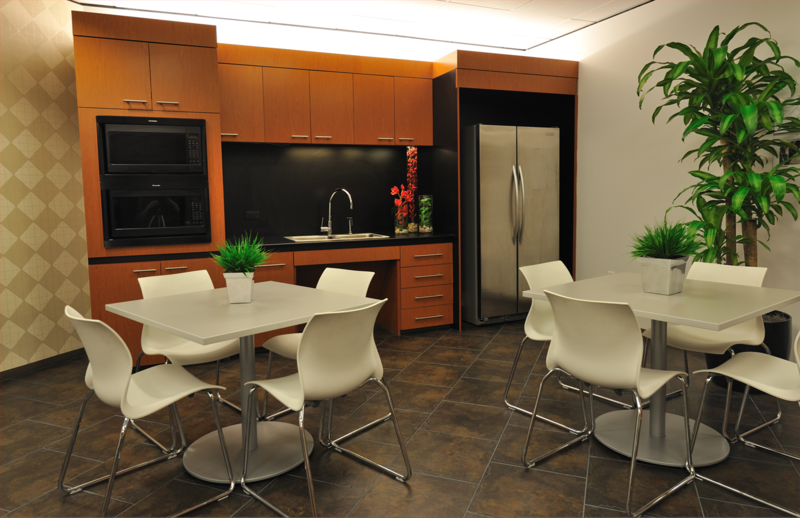 An employee breakroom set up with special considerations in mind for them can do just that. Breakrooms are often stuck in a corner, typically without windows. The place can become the catch-all for mops and brooms along with boxes of supplies. And there may be little chance of finding a comfortable place to sit, whether to eat lunch, read a book, check emails, or just reflect. Maybe there’s a table—or not. This also doesn’t address the cleanliness of the space. None of these factors contribute to a welcoming space which employees can use to their benefit. Determine what belongs in there and what doesn’t. If such things as cleaning supplies need to be there, find a place in which to store them—-inside a cabinet or behind a curtain or screen. Don’t let the space become a drop-off area. Provide a clean and comfortable place for staff to eat or have a cup of tea. A small table and a few chairs are all that’s required here. If there’s space, provide additional seating (such as a recliner or a rocker) enabling staff to relax without having to sit at a table. When there are no windows or the view is less than spectacular, artwork can fill the gap. Have something on the walls that is beautiful and inspirational to provide the vision a window ordinarily would. Assign someone the task of doing periodic checks in the staff room to make sure things are put away, tables are wiped off, and items are picked up. A weekly staff rotation may work to assure the breakroom is in optimal condition. Even the smallest clinic or the smallest department needs a place for staff to “let down” in privacy. The condition of the staff room gives a message to staff about their value to the organization. If they’re valued, they will, in turn, value those they serve. A happy staff translates into happy patients and satisfied residents.